To put it short, this is a mod that allows you to take one blocks model and colliding box and all that stuff, and put a diffrent texture onto it. 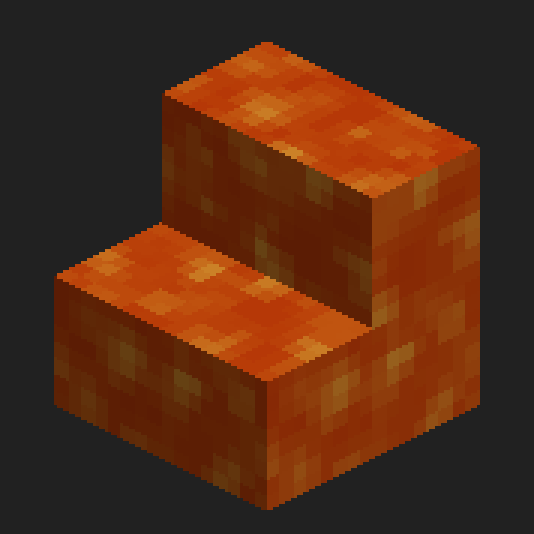 For example, you can take the stair block, and but ANY other blocks texture on it. You can do the same with fences, and every other block in the game. Its simple! There are currently no crafting recipes in the game, so they only way to use this mod in survival would be to create your own. There will be recipes in the future. To use this mod, first take a Block Capture Card and right click on the block you want as the model. Then, get a new Block Capture Card, and right click on the block you want as the texture (If you want a liquid as the texture, please use the Liquid Capture Card). Place down the Cloaking Machine, and open it. At the top left place the Capture Card for the block you want to be the model, and at the top right, the Capture Card for the block you want to use a the texture. You will then see the model being rendered in the center of the screen. (Holding right click will move the model around). Once you are happy with your model, place a Cloak Block in the slot to the left (shift clicking it will do), then click the button labled "Cloak". This will then set the output item to be the Cloaked Block. Now you can go and make your world just that much better! If you still require help, consult the videos below. Also included within this mod is indevidual face texturing. That means you can have a block with the top texture being stone, and the sides being dirt. To do this go into the Cloaking Machine, and place your model and base texture Capture Cards. Then, left click on the face you want to change. It will be highlighted, and in the top right a new slot will appear. Place the capture Card you want the certian face to change to and there you go. Your model should be rendering in the center. Then just put a Cloak Block in the left slot, click the button and there you go. If you still require help, consult the videos below. Please note that this is still in very early testing, and does not yet work on servers. Firstly, after you load up the game, go to your games run directory / .minecraft (Instructions on how to do that can be found here). There should be a folder called "cloak-images". If not then create it. Then, put the images you want to use in-game into that folder. There is currently no image size checking, so it dosnt have to be a square, or 16x16, although the texture may bug out if otherwise. Once you've put the texture into that folder, go in game, and right click with the External Capture Card. You should see a list of all files within that folder (Gui isnt finished, its just a placeholder for now). Type in the name (and file extension) of the image you want to use, then press enter. If it has worked, the image will be rendered inside the item. You can then use the Capture Card in the same way as other capture cards. If you need more help on this, consult the videos below. 2 tiers of Cloaking Machine, one can select faces, the other can't. This mod is very similar, but thought of and coded independently, to Paint ALL the things!, which includes some features this mod does not. If you enjoyed this mod, please go check it out. Has this mod been abandoned? Are you busy with other things, or have you abandoned this mod? It's a shame if it's the latter since as a creative builder, this is a better mod for me than the secretrooms mod (which is still all stone). Does this still crash servers? Mods look very interesting, would it be possible in future updates to use custom textures? Possibly have a folder in the config section where players can add their own textures, then in the game with the creator they are given a list with the name of their texture, they can then select the texture and have it applied to the block they're cloaking? Not sure if this is possible, probably not in this way, but it'd be an amazing addition, ultimately making the limit of blocks, well, limitless. I'm also curious if doors can be customized, as well as flowers perhaps if you can get the suggestion above functioning. This is a really good idea, its definatly possible, however the only issue is would be servers. When you join a server you would have to download all the custom images used. If I were to impliment this, I'd have to do it to have a max size of 16x16, or 32x32 if i can work on compression. Apart from that, itll be pretty easy to do. Another thing I could do, if i had the time, is to make it so you can design textures in game, however i dont know how well thatll work out, and it might just be easier to have them all external. Sounds great, external images would be easier for you and probably the better path to take. The whole door thing people could probably live without, but if you do decide to add the custom textures, I think it'd be best to try and include it. Thanks for the quick reply, look forward to utilizing your mod! I mean sign-picture code might be something you would want to think about observing. https://minecraft.curseforge.com/projects/signpicture?gameCategorySlug=mc-mods&amp;projectID=250822 Its not laggy at all.